Farmland protection and farm viability are two important aspects of urban-edge farming. Surveys of landowners and informant interviews were completed between 2005 and 2007 in 15 U.S. counties to examine the opportunities and constraints that farmers face in these areas. Landowners’ perceptions about the future outlook for their county’s agriculture varied greatly. Many operators in counties producing long-established crops, such as corn and soybeans, rely heavily on wholesale markets for sales. In other counties, farmers depend on a mix of wholesale and direct markets. Study results show that over half the respondents relying on direct markets operate small acreage farms with low gross agricultural sales. Operators using primarily wholesale markets tended to be more optimistic about the profitability and acces­sibility of their markets and the outlook for agricul­ture in their county than those depending on direct markets. In additional results from the survey, almost a third felt that equal emphasis should be placed on farmland preservation and farm viability efforts in order to keep farming viable in their county, while approximately the same number felt the priority should be protecting agricultural land from development via growth management policies. 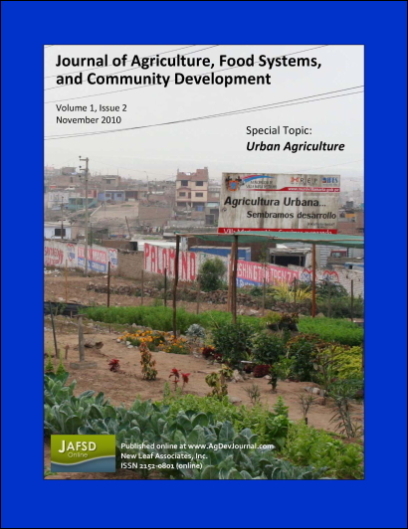 The unique characteristics of agriculturally important counties undergoing urbanization pressures pose challenges and opportunities to researchers and developers to recognize and employ the strategies that will help maintain a viable agricultural sector for urban-edge farming.